Replacing the bowl part of my favourite birdbath was something I never considered after two extremely cold winters finally took their toll and it split completely in two! I never even knew there were replacement bowls available if I went searching online. Since then, my bowl-less pedestal has lived on as a landing break for birds en route to a ground birdbath set at the top of the rocky slope down to my tiny pond. 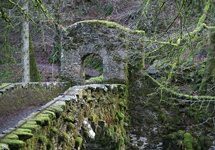 This location was also chosen as a photo hotspot knowing it could catch morning or soft evening light. It has worked a treat for both. Juvenile House Sparrow back on July 21st, 2013. 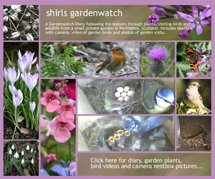 Experimenting with natural backgrounds for photo and video captures of visiting garden birds is something I have had fun with. 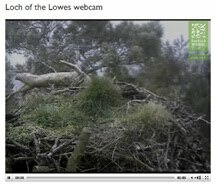 As my blogging years have rolled in, I have found myself setting up and planting areas I can expect to see birds visiting and patiently keep cameras (still and video) to hand. Last winter’s bamboo landing strip (for periods of thick snowfall covering the garden) also made for a good photo/video hotspot. Birds landed en route to the running water at my tiny pond and to a snow shelter/ low feeding table . In complete contrast to the bare borders of winter this bamboo landing strip has continued to be a success in the jungle of summer foliage and flowers. Juvenile partial albino Blackbird back on October 20th, 2010. Although I very much encourage birds and other wildlife to my garden I am still very much a plantswoman at heart and how my borders look remain an important part of the gardener that I am. 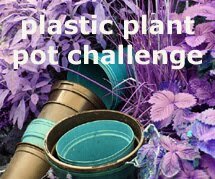 I had tried to accept the large plastic plant saucer by making it part of the border as best I could. I was forever changing the planting around it but it was never going to be perfect. 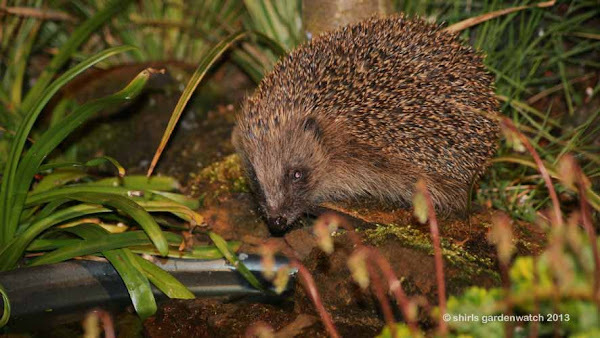 Regular evening Hedgehog visitor back on May 9th, 2009. 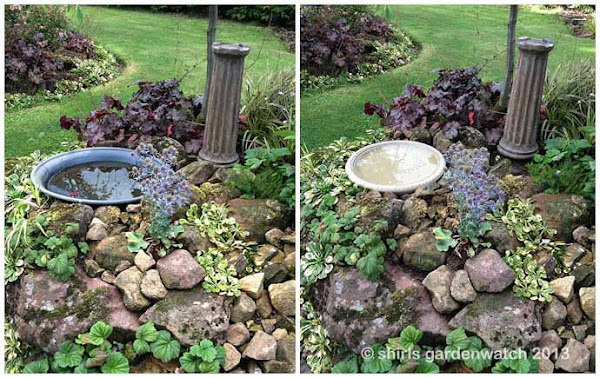 A gift of cash, followed by a new online search of birdbath images (I never found any ground birdbaths that caught my eye for my border location) took me to a replacement birdbath bowl and I liked what I saw! There was no glazing, it looked a good colour, it was hand cast, hand finished out of reconstituted stone and it was a good 15” in diameter. I was thrilled with my find and ordered it straight away! 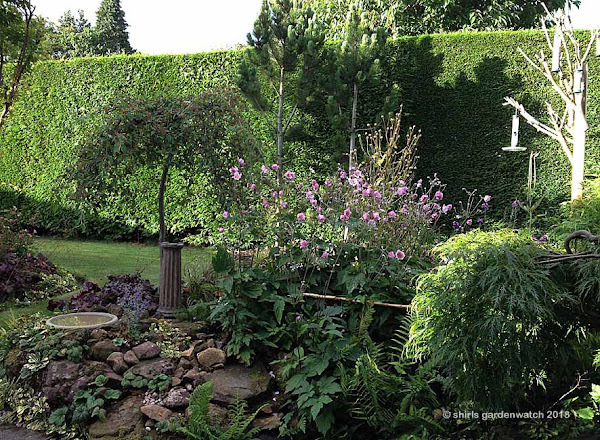 Let's take a look at the longer garden view of how the new birdbath fits in to the front side of this pond border. You can see the homemade feeder tree on the right - this is where the birds usually come from. You can also see why the location of the pedestal works as a break spot to the ground and where the bamboo landing strip fits in too. Birdbath newly installed, the day it arrived, back on August 16th, 2013. Close-up before and after photos, the small sea holly has been moved since. Juvenile birds in birdbath, 2min 45sec with background music, try HD quality. I should add here, I’ve not been given this product for a review. However, I have never been so impressed by the packaging of a product I have received from an online purchase – ever!! I wanted to say… good job and thank-you! The opened box and close-up detail of the handcrafted birdbath. Orders of this birdbath can be made directly from the supplier a “long-established family-run company based in the heart of Lincolnshire’s farmland”. As a thank-you, I’d like to add a link direct to their product here . At the time of writing this blog post, the product cost is the same as with Amazon but I cannot comment on any possible difference in delivery times. 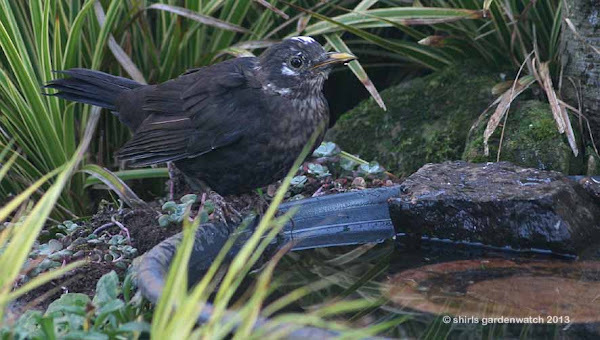 FAO: all blog visitors, oops…have I really chatted so long on birdbaths? It may seem over-the-top but I cannot stress enough what adding a dish of water (an old baking tray would even do) can add to a garden. 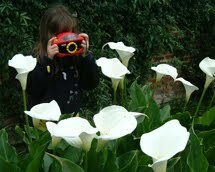 I am guessing that many of you will know this already but pre blog and gardenwatching I never appreciated this at all. 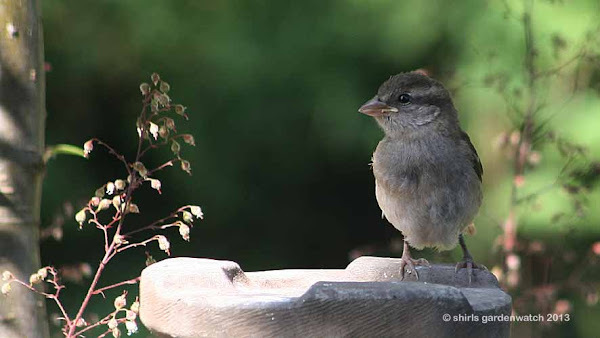 Wishing everyone a great weekend – please do share any birdbath stories you have before you go. Have you a homemade one that works for you? What birds are been visiting your birdbath just now? I’ll take a guess at you’ve had juvenile birds too – which ones? Wow! You have a video! Love the new birdbath. I have several but rarely see them in use. I think we were on the same wavelength this week. Good to see you again. Terrific piece of video Shirl. Love the way the juvenile Blackbird only paddled until it saw the sparrow have a splash about and then decided to have a go itself. I love how young birds often don't quite get the hang of bathing. Watching one trying to bath in about a centimetre of water is really funny. It has the actions but remains dry. 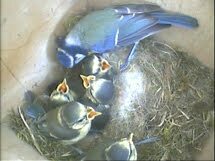 Lovely video, thanks for sharing it with us, the new birdbath is a great success with you and the birds, everyone's happy! I have the odd saucer and other water retaining bits at various places around the garden, including a birdbath and my itsy bitsy pond. Yet, they are not visited regularly. They obviously get their water and bath elsewhere! As usual, great images Shirley - off now to watch the video! Nearly forgot to add, your new birdbath is lovely and good to read you are pleased enough to recommend! The birdbath is great. I have an in-ground and an above ground birdbath. The birds are in them a lot especially now. There is no water anyplace except in the bird baths around here. It is so dry. My garden is suffering... :( It is funny to watch the small birds drinking and trying to bathe in the ant trap above the hummingbird feeder. Wish I had video of that to share. Have a great weekend. 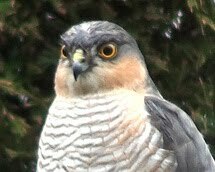 John, thanks, I was delighted with this capture – lucky to look out window at this time. Yes, it was fun watching the way the young birds seem to learn from each other. Your bird photos are so attractive and I loved the post also. 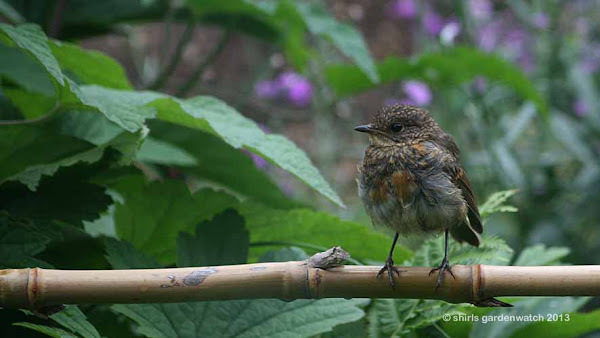 I've just introduced a bird area to my garden and it brings no end of joy to see them used it.